We are pleased to offer this detached four bedroom home set on this renowned Architect designed development off Coombe Lane West. The property is situated in a more enviable location within this development and backs onto Marymount International School. The highly respected Coombe Infants School is close by which provides excellent schooling along with many other well renowned and varied establishments with the Coombe, Kingston Hill and Wimbledon area. Transport opportunities to London and into Surrey can be found at Norbiton, New Malden and Raynes Park mainline rail stations and are complemented by the excellent bus network in the area. The A3 is within ½ a mile and offers an arterial route into London. The wonderful open and picturesque spaces of The Royal Richmond Park are also within ¾ mile. Lord Chancellor Walk is a small exclusive development situated in one of the most sought after parts of Coombe Hill. It was designed by acclaimed London architects, Messrs Fitzroy Robinson and Partners and was built in the early 1970’s. The original architects have paid meticulous attention to detail to provide these homes with bright spacious rooms using the highest quality of materials available at the time. The site itself benefits from an open aspect, with parkland style front gardens set among mature lawns, specimen plants and conservation protected trees. The houses are intelligently laid out to maximise privacy, sense of space and the historic trees. Lord Chancellor Walk is conveniently located close to Kingston town centre with its excellent shopping facilities, and the A3 offering fast and easy access to Central London and both Gatwick and Heathrow airports via the M25. The area is well served with links to London via Norbiton station, which provides a frequent service Vauxhall and London Waterloo with their underground links to points throughout the city. The immediate area offers a wide range of recreational facilities including three golf courses and tennis and squash clubs. Richmond Park is within easy access and provides a picturesque setting in which to picnic, go horse riding, jogging or just to take a leisurely walk. Theatres at Richmond and Wimbledon are also popular alternatives to the West End, with both having an excellent choice of restaurants. Guest Cloakroom: Suite comprising of wash hand basin and low level WC. Dining Room: 12’6 x 10’10 (3.80m x 3.30m). Large sliding patio doors with views to the rear garden, carpet. Kitchen/Breakfast Room: 20’8” x 11’4’’ ( 6.30m x 3.45m). Built in electric hob, white double sink with mixer tap set within a range of limed oak wall and base units. archway through to breakfast area. Built in refrigerator, space for washing machine and tumble dryer, Rear door to covered providing access to front and rear gardens. Landing: Half landing window providing glorious views over Coombeside, offering potential for extending present living space. Dressing Room: 9’10” x 8’ (3m x 2.45m) (including cupboards). Built in floor to ceiling wardrobes, window to front garden. En Suite Bathroom: Cream suite comprising of two built in wash hand basins with mixer taps, each with mirror above, recessed shelving, low level WC with concealed cistern, tiled panelled bath with mixer taps and electric shower attachment, fully tiled floor and walls. 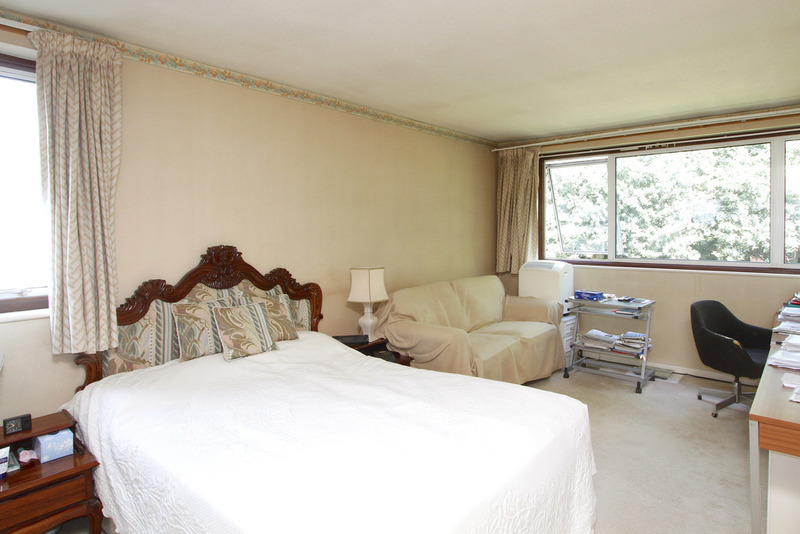 Bedroom 2: 13’9” x 12’8” (4.20m x 3.85m) built in floor to ceiling wardrobes, window overlooking rear garden. Family Bathroom: 9’9 x 6’9 (2.97m x 2.06m). Light pink suite comprising of built in wash hand basin with large mirror above, panelled bath with mixer taps and shower attachment, low level WC fully tiled walls and floor. Bedroom 3: 13’7”x 12’4’’ (4.15m x 3.75m) (including cupboards). Built in floor to ceiling wardrobes, window overlooking rear garden. Bedroom 4: 10’2” x 9’2” (3.10m x 2.80m) (including cupboards). Window overlooking front garden. Rear garden: Measuring approximately 28’10” x 70’ (8.80m x 21.33m). 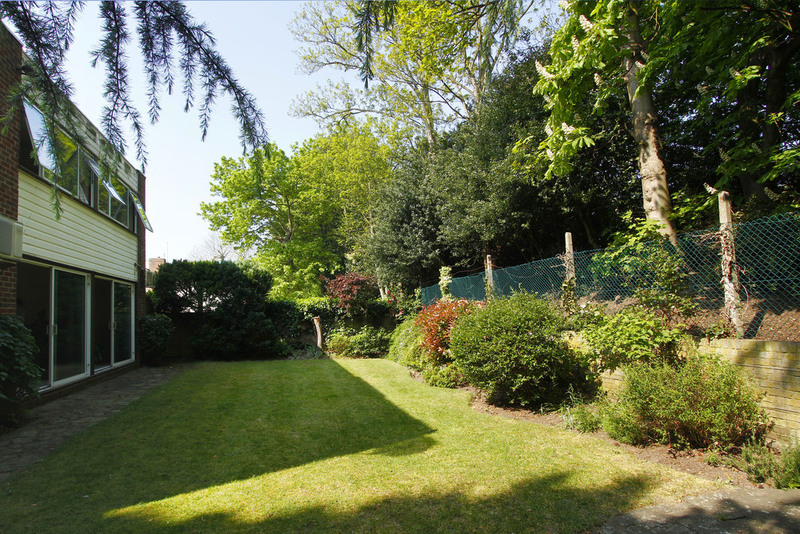 Surrounded by mature trees and shrubs the garden is mainly laid to lawn with a terraced area. Through a wrought iron gate the garden continues to another paved area and a large side garden, where the property can be extended to two levels, subject to the usual planning consents. Double Garage: 19’8” x 19’ (6.00m x 5.8m). Electric operated roller door into double width garage. Rear door gives access to the side of the house, with potential for extension. NOTE: No warranty is given concerning this property, its fittings, equipment or appliances as they have not been tested by the Vendors Sole Agents. Measurements are approximate and no responsibility is taken for any error, or mis-statement in these particular which do not constitute an offer or contract. No representation or warranty whatever is made or given either during negotiations, in particular or elsewhere.